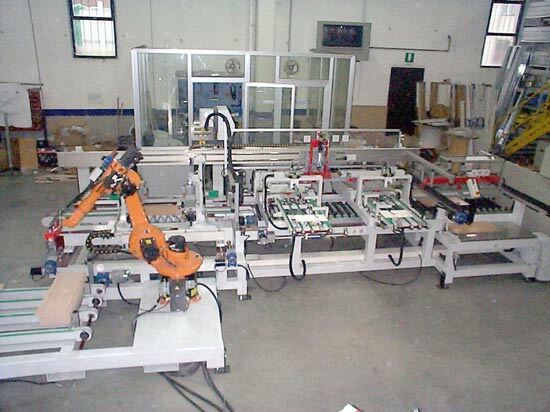 Process are a unique precision engineering company that will design systems to cut and machine panels, followed by the packing or palletising of those components by the use of robotic technology. Such products as the present trend of laminated flooring tiles are a speciality. Standard equipment produced by Process is the fully automatic assembly and glueing of 5 and 7 piece doors, with glazed panels if required and the fully automatic assembly of profile wrapped (V-grooved) draws (complete with base and draw front. Both machines will produce 4 components per minute. The following illustration shows a typical draw assembly machine. Other stand alone machines in the Process range are the automatic gluing of frame components prior to assembly.